Dissolve the yeast in the water and add the sugar. Leave for 5-10 minutes. Meanwhile, in a mixer, combine the flour and salt. Drizzle in the olive oil until combined with the flour. Pour in the yeast/water mixture and mix until just combined into a sticky mass. Form dough into a ball and drizzle olive oil over it and toss to coat the dough. Cover with a tea towel and set aside 1 to 2 hours. Place the dough a lightly floured surface. Put the chopped rosemary on top of the dough and very gently knead it into the dough. Don’t over knead. Roll into a thin oval. Place on a sheet pan drizzled with olive oil. Drizzle more olive oil on top of the dough and cover with a tea towel again. Put in a draft-free place for an hour. Remove the tea towel and poke holes all over the surface of the dough. Drizzle the surface with more olive oil and sprinkle with kosher salt. 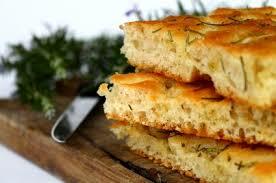 Bake until the focaccia is golden brown, 30 to 40 minutes.